I’m excited to feature this article by Nina of Sustainable Baby Steps because it’s an excellent summary of 20 different antibacterial and antiviral herbs. This is a post you’ll want to keep so you can refer back to it in the future. How the herb can be prepared e.g. It can be used in infusions, tinctures, lotions and ointments. 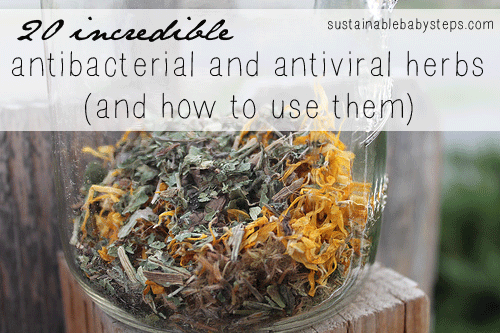 Click on the 20 Antibacterial and Antiviral Herbs and How to Use Them link below to see Nina’s article. oil, but they are also full of chemicals that you could do without. etc. You see, the lauric acid kills the bacteria that causes ulcers, H.